Lose That Girl: RATE IT! 2010 -- It's Ugly! Summer has yet to take a bow and *already* 2010 calendars are making their debut. I guess if Hallowe'en candy is already plaguing shops near me, it makes sense that next year's date books are bubbling under too. 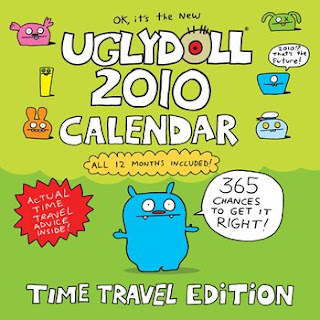 Here's one calendar that will have you looking ahead to 2010 - the Uglydoll 2010 wall calendar. In a twist, the authors have put their mutant playthings into a time travel theme so perhaps you *can* take them with you! Enjoy!